I’ll be honest, I’ve shared variations on this recipe before, but it’s always been a part of another recipe: salad dressing as part of a salad recipe, dressing for roasted veggies… You get the picture. This recipe is so good and so versatile though, I had to share it on its own. Believe me, once you’ve tried this balsamic vinegar and mustard dressing, you’ll never go back to the bottled stuff from the grocery store. My boyfriend Sean actually introduced this recipe to me shortly after we started dating. He began making it when he was eating paleo and liked it so much that even after he stopped, he continued to make the dressing. And I’ll tell you, we’ve served this dressing to plenty of people and so many have asked for the recipe afterwards. The best part? This balsamic vinegar mustard salad dressing is paleo-friendly, gluten-free and low sugar. Plus it doesn’t taste that way at all, and with just a few staple ingredients from the cupboard you’ll be good to go. Just delicious. Trust me, you’ll love it. Combine all ingredients in a jar or bowl. Mix well. Pour liberally over salad, roasted vegetables or even grilled meats. Store in an airtight bottle in the refrigerator for up to two weeks. 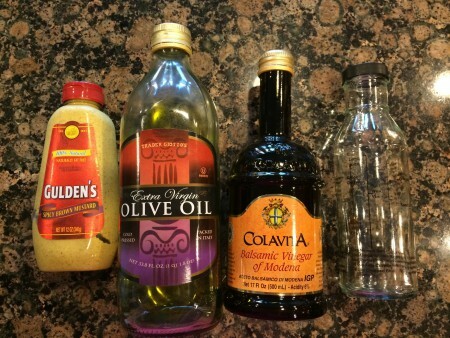 Here are all the ingredients you need to make this super simple salad dressing. Trust me, this dressing looks so much better once it’s shaken up. It tastes even better. 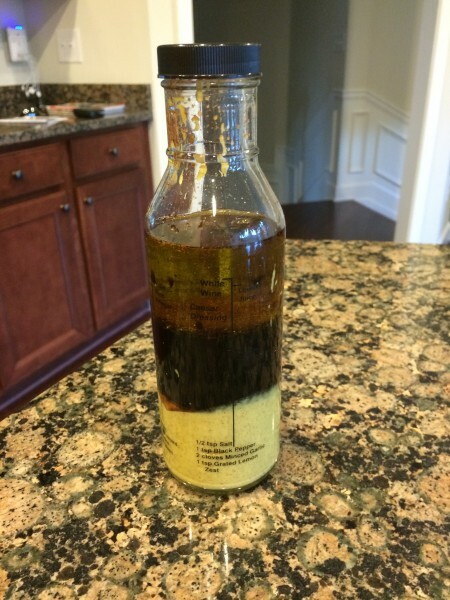 This entry was posted in Recipes, Side Dishes and tagged Balsamic Vinegar, Dressing, Gluten Free, Low Sugar, Mustard, Olive Oil, Paleo, Recipes, Salad Dressing, Side Dishes on August 27, 2014 by Paige N..
Yum, I love balsamic vinegar dressing! So I’m sure this will taste amazing! Thanks! If you like that you should check out my balsamic roasted cauliflower recipe too.